As conversation about play selection began for Asheville Community Theatre’s 71st season, staff were unsure of exactly how many shows would be chosen. A typical season on the Mainstage holds six musicals or dramas, Youth Production Classes, Saturdays at ACT, Student Matinees as well as a variety of special events. However, with a renovation on the horizon, scheduling was a challenge to say the least. The renovation was set to begin in January of 2017, cutting the season in half and leaving ACT with only October through December available. A shortened season was not the only issue, though. Limited space from January 2017 forward didn’t allow for Youth Production Classes to have performances or for Tanglewood Summer Camp to have the space usually provided. Lucky for ACT, an alternative opportunity arose. Rob Bowen, UNC Asheville’s Chair of Drama, reached out to ACT with an offer to unite. 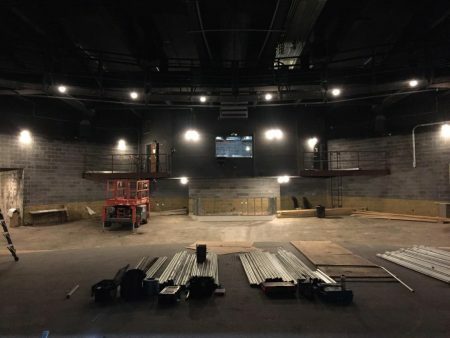 UNC Asheville and ACT would partner on a Mainstage show (Peter and the Starcatcher), two Youth Production Classes (The Lion, the Witch, and the Wardrobe and Shrek the Musical Jr.), Broadway Bootcamp, and Tanglewood Summer Camp. Performances would take place at UNC Asheville’s Carol Belk Theatre and rehearsal space would be split between both UNC Asheville and ACT. ACT agreed and a collaboration began. Last month, rehearsals started for the first show of the partnership: Peter and the Starcatcher. Unlike other productions, Peter and the Starcatcher offered a unique chance for community members and college students to collaborate. Half of the cast would be UNC Asheville students and half members of the community. In addition, many of the production team—including Jill Summers (Set Designer and ACT Technical Director), Carina Lopez (Costume Designer and ACT Costume Shop Manager) and Andi Espenshade (Assistant Director) would be UNC Asheville alum. Students would build the set, create the costumes, and be a part of run crew for performances alongside Jill Summers and Carina Lopez. Community members would get a chance to work in the round and challenge their comfortability with a more uncommon space. For both parties, it was a win-win. Without the offer to partner from UNC Asheville, much of ACT’s 71st season would be blank. Even beyond the space to perform and rehearse, UNC Asheville has been more than gracious with parking and maps. ACT even has a UNC Asheville student as an intern this semester—Traci Wallace. Our sincerest gratitude goes out Rob Bowen, Suzie Morris, and everyone at UNC Asheville. We are excited for this collaboration! If you’d like more information about Peter and the Starcatcher or any of the partnership productions, please visit our website at ashevilletheatre.org. Peter and the Starcatcher opens March 30th, 2017 and runs through April 15th, 2017 at the Carol Belk Theatre on the campus of UNC Asheville. If you’d like to purchase tickets, please click here.